The worldwide practice of Hinduism encompasses a wide variety of beliefs. However, a prevailing belief that is shared by most, if not all, Hindus is the importance of physical and spiritual cleanliness and well-being... a striving to attain purity and avoid pollution. This widespread aspiration lends itself to a reverence for water as well as the integration of water into most Hindu rituals, as it is believed that water has spiritually cleansing powers. • Holy places are usually located on the banks of rivers, coasts, seashores and mountains. Sites of convergence between land and two, or even better three, rivers, carry special significance and are especially sacred. Sacred rivers are thought to be a great equalizer. For example, in the Ganges, the pure are thought to be made even more pure, and the impure have their pollution removed if only temporarily. In these sacred waters, the distinctions imposed by castes are alleviated, as all sins fall away. • Every spring, the Ganges River swells with water as snow melts in the Himalayas. The water brings life as trees and flowers bloom and crops grow. This cycle of life is seen as a metaphor for Hinduism. • Water represents the "non-manifested substratum from which all manifestations derive" [Dr. Uma Mysorekar, Hindu Temple Society of North America] and is considered by Hindus to be a purifier, life-giver, and destroyer of evil. • Milk and water are symbols of fertility, absence of which can cause barrenness, sterility leading to death. 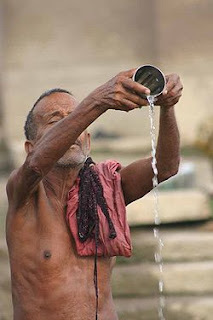 • Water is very important for all the rituals in Hinduism. For example, water is essential as a cleaning agent, cleaning the vessels used for the poojas (rituals), and for Abhishekas or bathing of Deities. Several dravyas or nutrients used for the purpose of bathing the Deities and after use of each dravya water are used for cleansing the deity. Water offered to the Deity and the water collected after bathing the Deities are considered very sacred. This water is offered as “Theertha” or blessed offering to the devotees. • Poorna Kumba literally means a full pitcher ("poorna" is full and "kumbha" is pitcher). The Poorna Kumbha is a pitcher full of water with fresh leaves preferably of mango tree and a coconut placed on the top. Poorna Kumbha is an object symbolizing God and it is regularly used during different religious rites. The water in the jar is said to be divine essence. • Many of the poojas in Hinduism start with keeping a kalasa which is a brass, silver or gold pot filled with water adorned with a coconut amidst mango or other sacred leaves. Kalasa symbolizes the universe and becomes an integral part of the Mandalic-liturgy as it still forms an indispensable element of certain poojas in Hinduism. The pot is the first mandala into which the Deities descend and raise themselves. • One of the religious rituals is tarpana, which means to please or to gratify. Specifically, tarpana is the act of pouring water through the hands with the use of sacred grass as a symbolic gesture of recognition, thanking and pleasing Gods, sages, and fathers. • During all purification rites water is sprinkled on the objects which are to be purified. Water used to be sprinkled on any offerings to the deities. • Before starting a meal Hindus sprinkle water around the leaf or plate in which the meal is traditionally eaten. • In times past, a King was sprinkled with water in order to purify him during his coronation. This was believed to ensure an auspicious beginning to his reign. purifies the mind and the body, Aghamarshana or expiation for the sins of many births, and Surya Arghya or ablutions of water to the Sun-god (the other two non water-based elements of the ceremony are: Pranayama, or control of breath which steadies the wandering mind, and silent recitation of Gayatri; and Upasthana, or religious obeisance). The first part of Arghya consists of hymns addressed to water and its benefits. The sprinkling of water on the face and the head and the touching of the different organs (the mouth, nose, eyes, ears, chest, shoulders, head, etc.) with wetted fingers, are meant to purify those parts of the body and invoke the respective presiding deities on them. They also stimulate the nerve-centres and wake up the dormant powers of the body. The Arghya drives the demons who obstruct the path of the rising sun. Esoterically, lust, anger and greed are the demons who obstruct the intellect from rising up (the intellect is the sun). • Achamana is the sipping of water three times, while repeating the names of the Lord. One becomes pure by doing Achamana after he answers calls of nature, after walking in the streets, just before taking food and after food, and after a bath. • Jalanjali is a handful of water as an offering to the manes, gods, etc. A rite observed before an idol is installed is Jaladhivaasam (submersion in water) and Jalasthapanam is another rite. 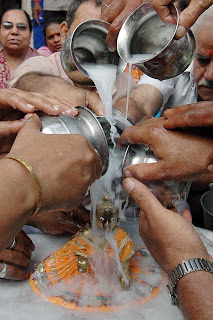 Pouring water on the head in purificatory ceremony is Jalaabhishekam. • A religious austerity to be observed in water is called Jalavaasam. It is also abiding in water. One who lives by drinking water alone is Jalaasi. 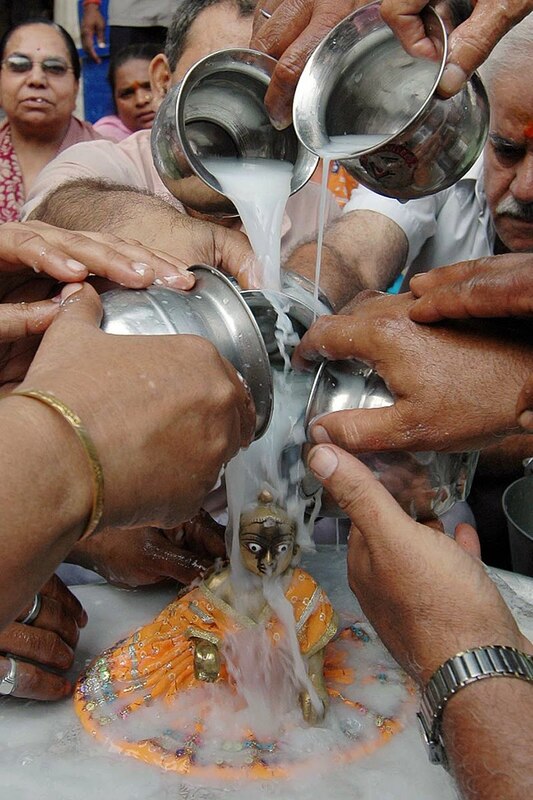 A religious vow or practice in which a devotee lives by drinking water alone for one month is known as Jalakricchram. • Chanting of mantras standing in water is Jalajapam. A kind of penance observed by standing under a continuous downpour of water is Jaladhaara. Neernila is chanting of hymns while standing in water. • A bath performed in the holy water for the achievement of some desire is called Kaamyasnanam. Prokshana is sprinkling water over oneʼs body to purify, when a bath is not possible. This is for internal as well as external purity. • Immediately after childbirth, a close relative of the child pours a few drops of water on the body of the child using his right hand, which is called Nir talikkuka. It is said that the child will get the character of this person. As such, a close relative with good character does the ritual. • The Vedic declaration says that water offered to Sun in the evening converts the drops of water to stones that cause death to the demons. For humans, demons are like all sicknesses like typhoid TB, pneumonia etc. When a devotee takes water in his hands while standing in front of or facing the sun and drops water on the ground the rising direct Sunʼs rays fall from the head to feet of the devotee in a uniform flow. This way water heated by Sunʼs rays and its colors penetrates every part of the body. This is the reason why the Vedas direct the devotee to offer water when the Sun is about to set. • To alleviate fevers, sprinkling holy or consecrated water on the sick person, chanting mantras is Udakashanti. While the water being sprinkled muttering a curse can affect a metamorphosis, the Hindu saints were able to curse or bless using this ʻsubhodakamʼ. • Water Therapy, both external and internal, has been practised for centuries to heal the sick. Usha Kaala Chikitsa is Sanskrit for water therapy. According to this ancient system, 1.5 litres of water should be consumed each morning on an empty stomach, as well as throughout the day. Water Therapy is considered to be a material way of taking an "internal bath". • Water plays a significant role in death as well. Many funeral grounds used to be located near the rivers in India. After cremation, the mourners bathe in the river before returning to their homes. After the third day, the ashes are collected, and on the tenth day these are cast into the holy river. • The rhythm of life is dictated by water and Hindus hold the rivers in great reverence. India is a country that not only nurtures resources nature has bestowed upon her, but also worships them for the all-around prosperity they bring in their wake. The rivers are generally female divinities, food and life bestowing mothers. There are seven sacred rivers which are worships – Ganges, Yamuna, Godavari, Saraswati, Narmada, Sindhu, and Kaveri. • The Ganges River is the most important of the sacred rivers. Its water used in pooja or worship if possible a sip is given to the dying. It is believed that those who bathed in Ganges and those who leave some part of themselves (hair, piece of bone, etc) on the bank will attain Swarga or the paradise of Indira. the Ganga is not just a river but a mother, a goddess, a tradition, a culture and much more. • Indian Mythology states that Ganga, daughter of Himavan, King of the Mountains, had the power to purify anything that touched her. Ganga flowed from the heavens and purified the people of India, according to myths. The ancient scriptures mention that the water of Ganges carries the blessings of Lord Vishnu's feet; hence Mother Ganges is also known as Vishnupadi, which means "Emanating from the Lotus feet of Supreme Lord Sri Vishnu." 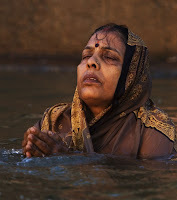 • It is not uncommon to see may Hindus who bathe or wash in the sacred river Ganges chanting the following mantra or mentally repeating it: Gange ca Yamune caiva / God_vari Sarasvati / Narmade Sindhu Kaver / Jale ʻsmin sannidhim kuru / Puskar_dy_ni tirthani / Gang_dy_h saritas tath_ / _gacchantu pavitr_ni / Sn_nak_le sad_ ...... Mama / Bless with thy presence / O holy rivers Ganges, Yamun_, God_vari, Sarasvati, Narmad_, Sindhu and K_veri / May Puskara, and all the holy waters and the rivers such as the Ganges, always come at the time of my bath. • Some Hindus also believe life is incomplete without bathing in the Ganga at least once in one's lifetime. Many Hindu families keep a vial of water from the Ganga in their house. This is done because it is prestigious to have water of the Holy Ganga in the house, and also so that if someone is dying, that person will be able to drink its water. Many Hindus believe that the water from the Ganga can cleanse a person's soul of all past sins, and that it can also cure the ill.
• The major sacred places, located on the Ganga are Varanasi, Haridwar and Prayag and these places are treated as the holy places of India, as these are situated in the bank of the holy river. • The largest gathering of people in the world occurs at the Kumbh Mela which is a spiritual pilgrimage celebrated every three years in one of four sacred cities of India: Allahabad, Ujjain, Nasik and Haridwar. In Hindu mythology, it is said that a drop of immortal nectar was dropped at each of these locations as Gods and demons fought over the pot or kumbh that held the nectar. Millions of Hindus travel to the Mela to bathe in the Ganga, believing their sins will be washed away and they will achieve salvation. For other visitors, the festival is a fascinating spectacle of size and eccentricity. Great article. I read. Am a Hindu and 67 years old. Awesome blog. Thanks For share this blog.